Overall, the expert consensus is that 2019 is going to be a good year for the HVAC industry. Particular growth in area’s like data centers and the educational market will lead overall growth in the sector which is expected to climb across the board as the reigns on capital investment continue to loosen around the USA. Leading the technology trends in HVAC are the area’s of connectivity and smart design, as more and more commercial building owners embrace the power of building automation and within that, investments in greener and cheaper, heating and domestic hot water delivery and control systems. Heating and cooling is a big expense for commercial buildings, accounting for 40 percent of the electricity consumed by a typical building. With utility companies offering better incentives to reduce electricity usage during peak times and the vast capabilities presented by the “Internet of Things (IoT) “, more and more businesses are jumping on the automation bandwagon. ‘Sensing and monitoring abilities and smart controls will continue to play a major role, and this year we expect to see even greater involvement in the complex task of building management,” explained Clay Steven, the manager of AHR Expo 2019, an HVAC industry conference held by the American Society of Heating, Refrigerating and Air-Conditioning Engineers and the Air-Conditioning, Heating and Refrigeration Institute. 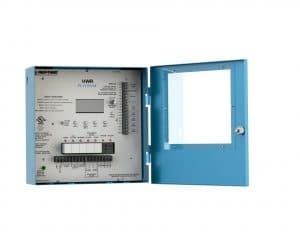 In commercial HVAC automation, sensors, connected controls and equipment regulate a building’s HVAC and domestic hot water system based on monitored data on everything from water temperature, to occupancy, temperature, pressure, carbon monoxide levels and time of day. The level of connectivity of sensors and systems will continue to increase, with more and more building managers and HVAC professionals implementing advanced energy management systems to create greener, and less costly energy usage, while still providing tenant comfort. So called smart controls (see Heat-Timer® Platinum Series Wireless Controls) and smart design will continue to expand and deliver even more value to clients with the implementation of AI in controls that can actually learn the heating characteristics of your building through a variety of sensors. Then these systems deliver alarms, and monitoring points right to the cell phones or iPad of interested building managers. Systems like our Heat-Timer Platinum Controls save operators money by both running your heating and domestic hot water at maximum efficiency but also by cutting wear and tear on your boilers and saving on expensive repair and replacement bills. In the 1920’s, the Heat-Timer® corporation made the very first heating controls for a nascent industry, and has been advancing them through every disruptive technology since then. Today we make the widest array of heating and domestic hot water controls to be found, making our systems the perfect choice for our HVAC installer/partners. With full wireless sensor arrays, electronic valves, a remote monitoring app, and self-learning software algorithms, there is no modern technology that does not inform the operational capabilities of our systems. When it comes to energy controls, Heat-Timer® is the one to beat. Contact us today for a consultation on your heating control needs. The Golden Gate Bridge and Heat-Timer?